On August 21 in Kadena Town, Masako Arakaki (left) is interviewed by American university students who have been searching for people in photographs from the U.S. occupation. 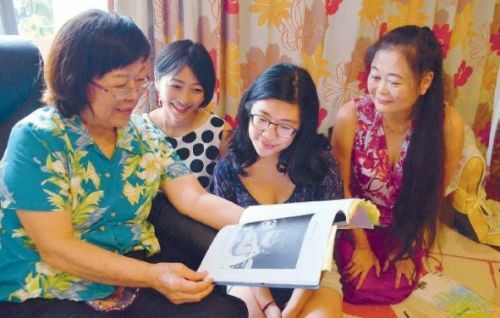 “The young woman in the picture is me.” Some American university students were searching for a woman in a photograph published on the front page of the local news in Ryukyu Shimpo on August 15, which was from U.S. military-occupied Okinawa in 1952. They succeeded in finding her, and interviewed her on August 21. The woman from the photograph is 74-year-old Masako Arakaki who lives in Kadena Town. When these students visited Arakaki’s home they could hardly contain their excitement. They said they had always wondered what kind of stories the people in these photographs had to tell, and that they were very happy to actually meet one at last. When the photograph was taken in 1952, Arakaki was 8 years old and lived in Nodake, Ginowan City. When she came home from elementary school, she used to search for playmates and frequently walked around the neighborhood. In the photograph, the young girl who appears to be Arakaki is carrying a younger child on her back. The young girl in the photograph had a stern expression with eyebrows knit, showing a strong-willed appearance while glaring at the camera. The photograph is one in a collection taken between 1952 or ’53 by a U.S. military surgeon, Charles Eugene Gail, stationed at Torii Station in Yomitan Village. Gail took pictures throughout Okinawa, and 150 of these photographs remain. Arakaki is the first person the project has found in the 5th year since it was started. A junior year student at the university, 21-year-old Julia Jen, said this is the first time they found someone through a newspaper and she truly feels the power of the media. She voiced her ambition to also absorb more radio and television, and find many more people. These university students will return to the U.S. on August 30 and continue looking for people from the photographs. More photographs can be viewed on the Gail Project homepage. For more information, email President Alan Christy of Cowell College at UC Santa Cruz. Her email address is achristy@ucsc.edu.